I recently completed this project and am so pleased with the results. It’s unlike most Beautiful Habitat projects that I feature here in that it is a design for my own home. This makes it part Beautiful Habitat “work” and part DIY project. To be fair, The design was all me, the build was all my husband. I’m so happy that he’s handy! First, let’s define the goals of the project. We are incredibly blessed to live with dedicated open space behind our home. Privacy is not an issue, and we also have great views. Therefore, we want something that can provide some privacy, light and heat control, but still provide some visibility. We have a more modern or urban aesthetic, yet lifestyle of the suburbs. We enjoy creating ways to urbanize our suburban home. Both as an Interior Designer, but also as an individual, I am drawn to unique things and I especially wanted an original and creative way to treat the standard sliding glass door. The first and most important step is always a good design plan. This included a number of sketches to work out the design and the measurements. The door had to be large enough to completely cover the sliding door and window above, 6′ W x 8′ H.
One of the longest parts of the process was staining the boards, particularly because a bitter cold front moved through Colorado, forcing me to move the staining into the basement… We also went with a 2 step staining to get the warmth and aged-look we wanted. Next came the layout and actual build. 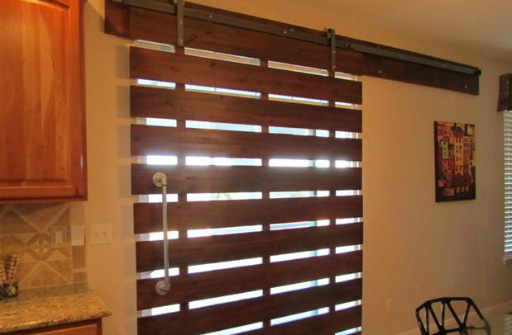 We chose hardware from a company called Real Sliding Door Hardware. We made the door handle from pieces of plumbing pipe found at any hardware store. Because the door is 6’x8′, the handle needed to be substantial to feel balanced with the door size. Finding a substantial handle is difficult. Finding one that doesn’t cost a fortune is nearly impossible. On to hanging… This was the most stressful part of the project! Once the hardware was up, it was time to stain again. Why didn’t I stain this with the other boards? The cold Colorado weather prevented me from staining in the garage. The 12′ L of this board prevented it from going down to the basement. Therefore, staining in place was the best option. Modern Barn Door Is Complete and hung!! Above, the door is closed. And a view with the door open. And partially open. Maximum functionality here! I hope you’ve been inspired to think out of the box in your home! What project would you like to try?